For the District in Taiwan, see District (Taiwan). "DPRC" redirects here. For other uses, see DPRC (disambiguation). After the 1980s, prefectures began to be replaced with prefecture-level cities. From then on, "cities" in mainland China became just like any other administrative division, containing urban areas, towns, villages, and farmland. These cities are subdivided into districts, counties, autonomous counties, and county-level cities. At the same time, counties and county-level cities began to be replaced with districts, especially after 1990. From then onwards, districts were no longer strictly an urban entities — some districts today are just like counties, with a large towns and townships under them governing rural areas. A regular district under a municipality or prefecture-level city. A type of city districts that are specially created for ethnic minorities. Currently there are 5 such "ethnic districts": three in Henan, one in Heilongjiang and one in Inner Mongolia. A special county-level division located in Guizhou. A special Sub-prefectural-level forestry district located in Hubei. A county-controlled district sometimes translated as county-governed district; county district or sub-county; (Chinese: 县辖区，区; pinyin: Xiànxiáqǖ, Qǖ) is a sub-county in the People's Republic of China. 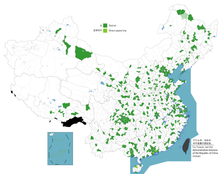 A branch of a county government, a district public office (Chinese: 区公所; pinyin: Qū gōngsuǒ) is the administrative office in a district, it is not a local government. A county-controlled district was once an important subdivision of a county all over China from 1950s to 1990s. It was common for there to be about 5 to 10 districts in a county, then about 3 to 5 towns and townships in a district. After the 1990s, county-controlled districts began to be phased out, and their role were taken over by larger towns or townships created by merging smaller ones. See Administrative divisions of the People's Republic of China for how these two types of districts fit into the general administrative hierarchy of mainland China. If the word "district" is encountered in the context of ancient Chinese history, then the word is a translation for xian, another type of administrative division in China. Xian has been translated using several English terms. In the context of ancient history, "district" and "prefecture" are commonly used, while "county" is used for more contemporary contexts. See Counties of the People's Republic of China for more information on the xian of China.